Square Foor Research is a newly created website started by an ex-researcher acquaintance of ours who had spent his past life writing property-related reports for one of them big research houses in Singapore. So the wife and I are pretty convinced that he knows his stuff when comes to the ins and outs of the Singapore property market. Square Foot Research provides comprehensive research on all sectors of the property market in Singapore. Not only do you get updated market reports and property-related articles, but the wife and I are particularly impressed with their "Trend and Analysis" section - this is especially helpful for those who are eyeing a specific project (both new and old). Some of the stuff you get (e.g. caveats info, developer's sales data, rental yields and buyer profile etc) are information that you will be more than willing to pay to obtain, which you can now access free of charge on this website. 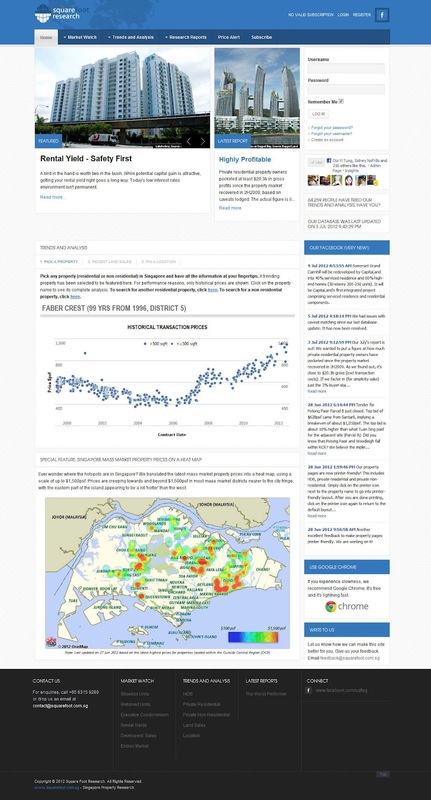 So check out Square Foot Research at http://www.squarefoot.com.sg/ today. Having said that, don't forget about our blog while you are at it! No Comment to " Check this out: Square Foot Research "